This is the only guide to estate agency fees (on the internet) written by ‘serial’ house sellers. You’ll find it uncommonly helpful thanks to it being based on experience, not theory. And you’ll get insights from a team that have had to pay estate agents over 6,000 times in the last 8 years. That’s roughly £12m in commission we’ve had to sign-off on. As you can imagine, we have opinions! Agents charging less than 1%+VAT make us deeply suspicious. Agents charging more than 2%+VAT for sole agency need to be able to demonstrate something exceptional. Agent charging anywhere between 1%-2%+VAT for sole agency (as long as they’re the best agent for the job) are actually pretty decent value for money. We would never pay fees upfront to any estate agent. We firmly believe ‘no sale no fee’ is the way to go. When do estate agents fees become payable? When can an estate agent claim their commission? Should you choose your estate agent based on cost? Which fee incentive and when? Most home sellers choose to use local high street estate agents that charge a ‘no sale no fee’ commission that’s a percentage of the final sale price. Most property owners choose to use just one estate agent at a time – commonly known as ‘sole agency’. 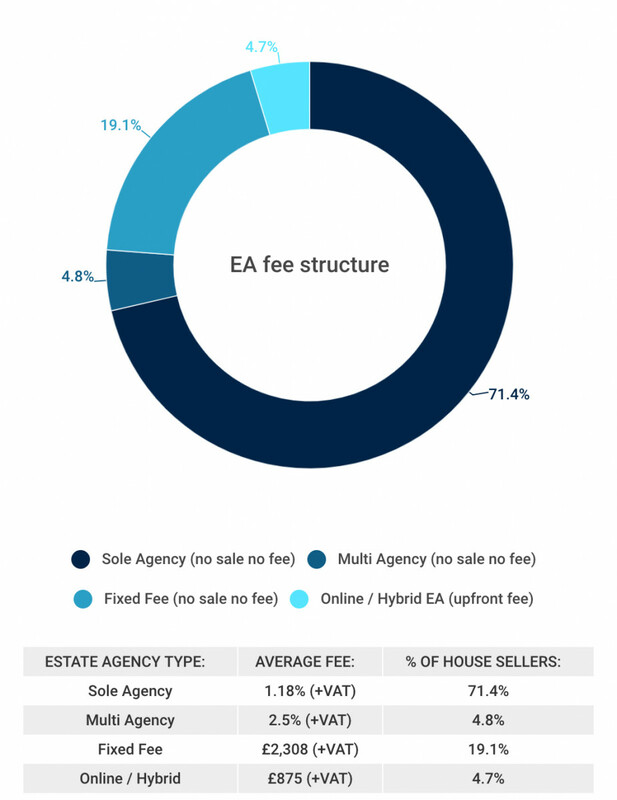 1.18%+VAT (1.42% inc.VAT) = The current average estate agency fee for a sole agency agreement on a no sale no fee basis (see research below). Estate agents tend to charge a higher fee if you choose to instruct two or more at the same time – commonly known as ‘multi agency’. 2.5%+VAT (3% inc.VAT) = The current average estate agency fee for a multi agency agreement on a no sale no fee basis (see research below). Some high street estate agents charge a fixed fee (again on a no sale no fee basis) – typically these are found in agencies selling lower value property (sub £100k). A minority of agents charge withdrawal fees but these must be detailed in their Terms & Conditions. It’s up to you whether you feel they are reasonable. They will certainly be negotiable. Online & Hybrid estate agents charge lower fees but they are usually payable upfront or deferred (for a number of months) via credit agreement. A number of these agencies have introduced ‘no sale no fee’ options which are all roughly twice the price of their upfront fee opinions. We don’t know the percentage of customers that opt for ‘no sale no fee’ but the UK’s #2 hybrid agency claims their cheaper upfront fee option is their best seller. Some online & hybrid estate agents charge extra for additional services such as; floor plans, professional photographs, accompanied viewings, For Sale board, sales progression, negotiating with buyers & the option to defer payment etc. Some high street estate agent also charge for extra services but usually; accompanied viewings, listings on all major property portals, photos of a decent quality, floor plans, negotiating with buyers, sales progression & for sale boards are all included in the agreed commission fee. All estate agents (high street, online & hybrid) are required by law to quote their fees inclusive of VAT – that’s worth remembering because not all estate agents play by the rules. All fees (what they’re for and when they become payable) must be clearly explained & confirmed to you in writing before you are committed or have any liability towards any estate agent. Survey of UK house seller hosted on TheAdvisory website (May – July 2018). That said, in reality, ‘averages’ provide limited insights. As the old statistical joke goes – if you put your head in the oven and your feet in the fridge, on average you’ll be perfectly comfortable. UK estate agents are CHEAP! They’re amongst the best value in the developed world. Just wait till you see what they pay in Mexico – Ay Caramba! If the estate agents is offers any additional services, the fee for these must be detailed upfront. The agent must put in writing; what they are for, what they cost (inclusive of VAT) & when payment for them becomes due. If you choose to take advantage of any additional services being offering, expect to have to pay for them if you withdraw your property from the market. EPC’s have a 10-year shelf life so if you have one, great! If not, then in accordance with legislation, you’re required to commission one before marketing of your property can commence. It’s normal for you to pay for the EPC upfront. Almost all estate agents will have relationships with an EPC provider and can arrange one on your behalf. The predominantly independent estate agencies I speak to charge around £78-£115 (inc.VAT). It’s not really a money-spinner for them. They just want to get it done quickly and correctly so they can start marketing your property. You can find adverts online for ‘cheap cheap’ EPC’s but arguably you’re more at risk of running into unexpected problems. I don’t get mine from the estate agents. I tend to get them from valuationsuk but that’s only because they cover the whole of the UK and I like to keep it under the one roof as that provides me leverage as a valued customer (they are a B2B not B2C provider). When someone searched Rightmove, by default the property are listed from highest price down to lowest price. A featured listings puts your property to the top of the list, regardless of its price. At the risk of upsetting the estate agency community, I’ll go on record and say I don’t see huge value being offered here. Yes, the number of clicks on your advert will increase but really, if your property is priced correctly & you’ve chosen a proactive estate agent with the right applicant database profile, then a featured listing is just not necessary. If the agent wants to throw it in for free, there’s certainly no reason to stop her. Watch out, some online / hybrid estate agents really overstate the importance / effectiveness of this optional extra, which is understandable given they are trying to charge you upwards of £200+VAT PER MONTH!!!! 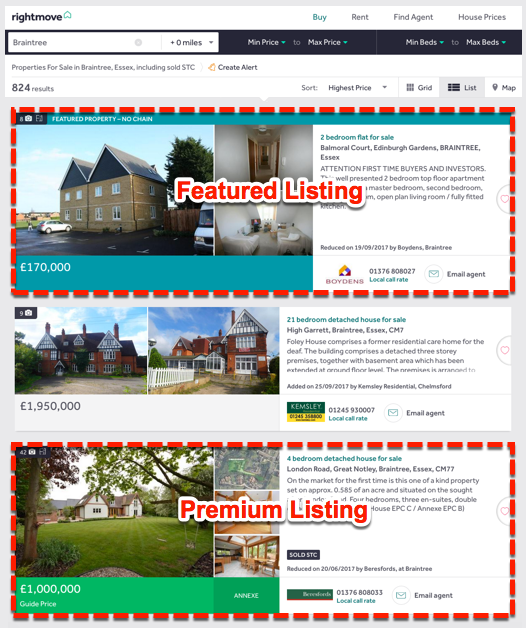 If you decide to sell with more than one estate agent, it’s likely one of those agents will take it upon themselves to apply ‘featured’ listing to your property (for free) in order to get an edge over the other estate agent they’re competing against. A ‘premium’ listing simply adds some minor highlights to your property advert so it stands out a little more in the list displayed on Rightmove. Worth it? That’s a ‘no’ from me. For the majority of low to mid-priced property, none of these things fall under the ‘must have’ category. For higher value property, it’s your call whether you see any value in what the estate agent is suggesting. The team here have paid for enhanced marketing packages (on higher value property) on numerous occasions and not regretted it. Most agents get paid on legal completion of the sale (once your buyer becomes legal owner of your property). Usually your agent will send their invoice to your solicitor once you exchange binding contracts with your buyer. Then on legal completion of the transaction, your solicitor will settle the agent’s bill directly out of your sale proceeds before transferring the balance to you. If you do not settle the agent’s invoice within the number of days stated in the agency contract, the agent reserves the right to charge you daily interest at a reasonable rate (approx. 5% above base rate). Be sure to check the agency agreement doesn’t entitle the agent to claim their fee on exchange of contracts because you’ll have to find the money outside of your sale proceeds. Have this changed so the fee is only paid on completion. Estate agents’ contracts commonly provide that the fee becomes payable as soon as a binding contract is entered into with the buyer – not ‘on condition’ that the completion takes place. This would mean the agent would still get paid if the contract were terminated between exchange and completion. If the buyer fails to complete then you can sue them and claim for damages for breach of contract. However, if you fail to complete, the estate agent will come for their fee and you’ll have to pay it out of your own pocket (see: Alpha Trading Ltd v Dunnshaw-Patten Ltd  QB 290). The agent must be the effective cause of the sale. This means that he/she must be able to show that their ‘introduction’ of the buyer led to the formation of the contract of sale between the seller and buyer. An ‘introduction’ may be nothing more than bringing the property to the buyer’s attention (see: Foxtons Ltd v. Pelkey Bicknell and another  EWCA Civ 419). Feel your agent is NOT entitled to their commission? If you need advice on whether an estate agent is entitled to a fee, get in touch. Happy to point you towards a trusted specialist that can access your individual case. Some people understandably feel the size of estate agency commission is unreasonable compare to the work done by the agent. I don’t disagree; in fact I’d go so far as to say that ‘post & pray’ agents are a total rip-off. Jargon buster: A ‘post & pray’ estate agent is one that simply posts your property up on Rightmove and prays the phone rings. However, experience has shown us, there are many excellent & proactive estate agents out there (if you know how to recognise them). This type of agent will bring far more value to your move than a member of the ‘post & pray’ brigade. We firmly believe (with sole agency fees well under 2%+VAT) the smartest thing any house sellers can do, is focus on identifying the best agent for the job, not the one that charges the cheapest fee. The most capable estate agents will naturally gravitate to the agencies where they can earn the best wages (i.e. agencies that charge decent fees). Agents that charge low fees have to take on a high volume of houses to reach a certain level of profitability – overstretched agents can not provide the level of service & attention to detail your sale deserves. Contrary to popular belief, the majority of estate agents are human. Most humans dislike working for peanuts! It’s demoralising having to work for anything less than what you believe you deserve. We firmly believe rewarding estate agents with a full fee is a strategic decision that ultimately pays you back in the form of a more secure sale, a better price and a happier working relationship with your agent. When selling a property, the smart figure to focus on is not the estate agents fee…. The smart figure is the amount you pocket from your sale, after the agent’s fee (i.e. your ‘walkaway’ amount). Recently I spoke with Diane whose sale wasn’t going according to plan. The reason why was clear – The agent she’s chosen was simply the wrong agent (for her property type). Diane was hesitant to say the least…. …They all charged more than 1%. Isn’t this attitude a little limiting, even and little arbitrary? Agent B is not just cheaper, they also claim they can get you a better price – A common tactic used by desperate estate agents. So at first glance you’re naturally thinking with Agent B you’ll be seriously quids in. Perhaps you also believe, all estate agents are basically the same, all they do is stick the property up on Rightmove, open some doors and then sit back and collect a commission? And, what the heck, got to leave a bit of wiggle room, where’s the harm in starting high? Understandably, if these are the beliefs you bring to your sale then again, Agent B is clearly the natural choice. Is highly motivated to sell your property because they’re earning a decent fee. In the above example, Agent A (the more suitable yet more expensive agent) pockets you an additional £8,530. And it takes less time with less stress. Of course, in property there is no such thing as a sure thing. It’s does more often than not though. Be in no doubt, estate agents are NOT all the same. True, they all do the same stuff. Some are vastly more skilful than others and the more skilful the agent you choose, the better the result you will achieve. A highly skilled (& properly motivated) negotiator can easily ‘net’ you an extra 3-10% on the sale of your home. Proof: The right agent can get you more! 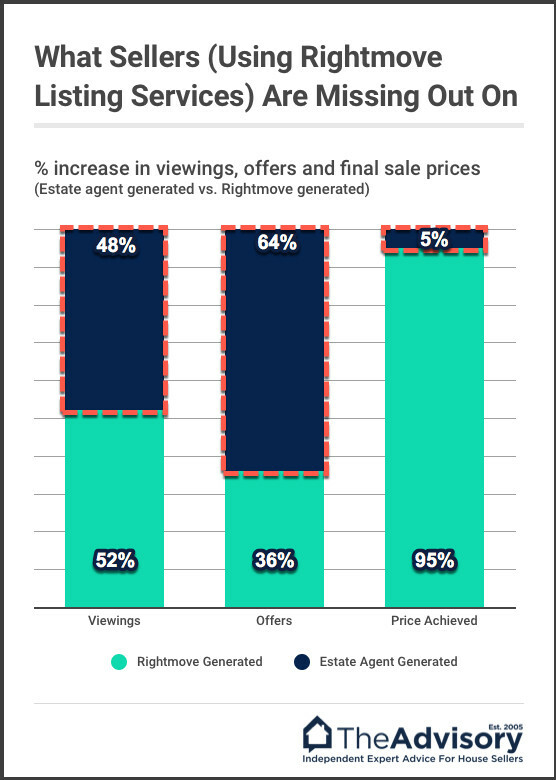 A recent study we conducted revealed the ‘right’ estate agent would achieve on average a 5% higher sale price compared to a ‘post & pray‘ estate agent. It’s certainly true the most expensive agent isn’t necessarily the best. Likewise the cheapest agent isn’t necessarily the worst. My advice is to leave fee to one side (to start with) and focus instead on finding the agent that’s best suited to your property. Then pay them a decent fee (even enhance the fee in some cases) so they’re highly motivated to secure you the best possible offer. Try not to let finding the cheapest estate agent become the goal / obsession. The saving you make in commission can easily be wiped out by the loss in your selling price. One of the best ways to test an estate agents experience & skill is to try and negotiate their fee downwards. You want to see which agents are quick to drop their fee and which are able to stand firm & justify their fee (or come to a more creative arrangement involving performance related incentives). Any estate agent that slashes their fee at the first sign of resistance should ring alarm bells for you. None of these traits are what you want in the estate agent that handles your sale. If an agency is charging low fees, you can be fairly certain the agents within it are earning low wages. This means these agents are likely to be of low experience because more experienced agents are able to secure employment at agencies that pay better wages (because they charge sellers higher fees). Agents go where they can earn the most money – the cream rises to the top. 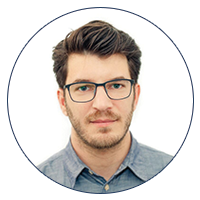 Agencies that charge a higher fee and refuse to negotiate on it generally have more experienced, better-motivated staff, and a lower staff turnover. Remember, finding a buyer and agreeing an offer is often the easy bit. It’s getting to exchange of contracts where; the fun begins, the trouble starts and an experienced agent adds value and earns their fee. Solicitors, mortgage lenders, surveyors, your buyer and all other parties in the chain must be chased, cajoled and handled with a delicate but firm touch in order for your sale to go the distance. That simply won’t happen efficiently or effectively if someone of little experience is handling your sale. If an estate agent is quick to give their own money away, they’re likely to give your money away too. If an estate agent can’t even justify their fee, it’s unlikely they’ll be able to justify your sale price to potential buyers. Properly trained, confident estate agents advise their clients’ NOT to accept anything other than the offer they believe to be the best one achievable. Desperate, weak or poorly trained agents advise their client’s to accept anything that comes along. On one, the seller has nailed you down to a 1% fee. On the other, the sellers has agreed to your standard 1.5% fee and is also offering 15% of anything achieved over an agreed target sale price (if you can secure a buyer within 4 weeks). If you were that agent, which house would you be trying the hardest to get buyers to view? Estate agents are contractually obliged to act in your best interest and exercise due care and skill. Theoretically, that means they are all legally obliged to do everything in their powers to get you the best result from your sale. And to be fair, a great many estate agents out there view it as a matter of pride to get their clients the best price (regardless the level of commission they will earn). They do it because that’s their job and it is the right thing to do. However, there are also a great many agents that are not like this (and because no one is actively policing this aspect of agency, what agents should do ‘in theory’ is fairly meaningless). Either way, enhancing the fee (or putting in place some other means to enhance motivation levels) will only have a positive effect on your sale. View it as your insurance policy against ‘average’ estate agency performance. This can be used to reward the estate agent for achieving a premium price or for selling the property quickly. Lets say the estate agent is suggesting a target achievable sale price of £500,000 and their standard fee is 1.5%+VAT. It’s best to have quite a major jump in the percentage of the fee being offered for both; “failure to achieve the target price” & “success in achieving over the target price”. 1.5% fee (their standard fee) if they achieve between £495,001 – £505,000. 1% fee if sell your home but fail to reach either £500,000 or a sale within your required timeframe. 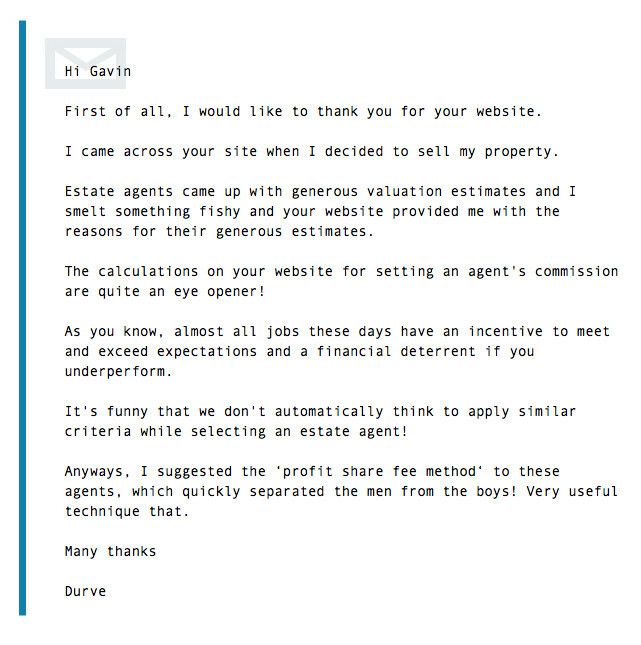 This is a good method to use on any estate agent that tries to justify their fee by saying they can sell your property for more than any other agent. An agent that makes bold claims is fine but you can’t be expected to take such claims on face value. This is a situation where the agent needs to put their money where their mouth is. If the agent agrees to this fee structure then good for them! You may well have just found one of the good guys. If the agent starts to squirm & backtrack on their property valuation, then you know you’re dealing with a fraud. With this method you offer the estate agent a percentage of the money achieved above their suggested target achievable price. It can also be mixed with the “sliding scale” method to penalise failure to reach the target achievable price of £500k. I can also be used to help negotiate a lower standard fee, while at the same time rewarding / motivating the estate agent to achieve a premium price. Again, in all scenarios, lets assume the estate agent’s standard fee is 1.5% and the target achievable price is £500,000. It gets the agents standard fee down for achieving your target sale price. It’s prevents them being demotivated by this because there is significant upside for them if able to achieve a premium price. It makes sure the agent is motivated to negotiate offers fully to achieve the maximum possible price. I along with most professional house sellers am a big fan of ‘multi agency’. Multi agency is when you instruct two estate agents to compete with one another on a winner takes all basis. It has to be ‘winner takes all’. Having agents share a fee doesn’t have the desired effect. The competition between rival estate agencies encourages the agents to be more than just ‘post & pray‘ merchants. It encourages them to hit the phones and work their buyer database – to really ‘sell the viewing’. It encourages the estate agents to fully negotiate offers because if they don’t they increase the chance of their rival agent coming in with a higher offer or a stronger buyer. Multi agency is not without it’s problems and certainly not for the faint hearted. If you’re not experienced in managing agents in this structure, there is much that can go wrong. If you have to sell your house fast and need your agent to focus 100% on your sale – offering a personal cash bonus of £800 (for example) for finding you a buyer willing to pay the figure you need will certainly focus their mind. I stress that such arrangements should only be made with the full knowledge and approval of the office manager or agency owner. To know which of the above strategies will bring you the most benefit, you need to know the true state of your local sales market. Is it ‘hot’ or ‘cold’? In a hot market you have a golden opportunity to get a premium price. There’s strong buyer demand and lots of activity. It should be easy for the estate agent to get buyers through the door and make a ‘so so’ sale. They can probably get by and make a sale, simply being a “post & pray” merchant. That would be a missed golden opportunity from your perspective. Instead, what you want to make sure of is that the maximum numbers of buyers are introduced to your property, and offers are negotiated fully. Best strategies for hot markets? In a cold market, things get tough because buyers are either thin on the ground or refusing to bite at the prices being asked by sellers. You need your estate agent to use every trick in the book to generate interest in your property. Best strategies for cold markets? If the market is really cold / quiet / dead, you could also simply offer a higher fee (say 2% instead of 1.5%) if the agent is able to get within 5% of the target achievable price. That should be enough to keep your sale top of the agent’s list of priorities. Success in a cold market comes from out manoeuvring the other sellers in the market and your estate agent’s other clients. Your goal is to be your agent’s favourite and most valued client. For everything above, with the exception of ‘multi agency’, it is wise for you to detail the structure & terms of the enhanced fee deal in a covering letter. This is to be attached to the estate agent’s standard Terms & Conditions document. Make sure the agent countersigns & dates this covering letter. Don’t forget to make 2 copies (one for you and one for the agent). Let me tell you about Francis T.
Sadly he was getting divorced and needed to sell one of his properties. Francis was having real trouble; the property just was not shifting and there was some sort of debt secured against it he really needed to clear (he didn’t share the exact details). He’d reached the point where he was speaking to cash house buying companies but the prices they were offering weren’t going to work for him. He’d also been talked into putting the property into auction. That’s when he contacted me. First thing I told him was that auction was a waste of time for his property. Then I explained the benefits of multi agency, fee incentives and the right way to identify the estate agents that can generate the most interest in the property. In Francis’s mind, the property was on Rightmove – End of story! He assumed all estate agents had access to the same buyers, and so all the buyers out there already knew about it. How could a change of estate agent or offering a fee incentive have any impact? I tried to explain that Rightmove is great at connecting people with estate agents, but it’s pretty inefficient at connecting people with property. I tried to explain that your choice of agent & how well you motivate / incentive them can (and does) generate additional interest in a property. Francis thanked me for the chat, but left things saying he’s been assured it will sell at auction, so he’s going to sit tight till them. WOW – 7 agents + a 4% fee!!? When Francis gets the bite between his teeth, he doesn’t mess around. I guess he ran out of options, and had nothing to lose re-examining what he already believed about how the property market, Rightmove and estate agents really work. I submit to you that I believe he could have achieved the same result with only 2 (well chosen) estate agents and a fee of 2%+VAT. But that’s beside the point, and I don’t want to take anything away from his achievement. This is not an uncommon as you may think. One of our special advisors is an authority on estate agency contracts & reclaiming unpaid fees for estate agents. He recently told me of one estate agency client (albeit a big multi branch player) that was in the process of reclaiming over £3m in unpaid fees (and that’s during a time period of only 18 months). Be in no doubt, if the agent has performed in accordance with the law (and the terms of an enforceable agency agreement), they are entitled to pursue you through the courts. Many estate agents retain specialist debt collection agencies to do just that for them on a regular basis. Here’s a lovely tongue in cheek blog from Ralph James estate agents on how to cheat your estate agent (and not get caught). High street estate agents are predominately ‘no sale no fee’. National online / hybrid estate agents are not. I point this out because services charging you upfront (or on a deferred payment basis) get paid regardless of whether they sell your house or not. That means (unlike ‘no sale no fee’ estate agents) there is the chance you will have to pay for failure to sell. Credible research claims these types of services have a 45%-50% failure rate. That’s massive and I’m not sure many members of the public realise this. It’s basically a coin-toss…Heads you win, tails you loose. Strictly speaking it ‘heads you loose, tails you loose’ but you’ll have to read a different guide for my full reasoning behind that. As such, for anyone choosing to use these services, there’s a pretty big chance they’re going to want / need to change agent. Paying upfront does little to motive the estate agent to sell your property and shepherd it successfully over the finish line. It’s dealing with chains, solicitor, mortgage lenders and surveyors where the real problems start and a proper estate agent’s experience is needed to keep things on track. A ‘no sale no fee’ estate agents won’t get paid until the deal completes – They want the same thing you do and should be motivated to stay the course so they can earn a fee. On the other hand, given they’ve already been paid, the ‘pay for failure’ can simply disappears off into the sunset (without penalty) when your sale gets sticky. And even if the ‘no sale no fee‘ agent turns out to be a dud, at least finding out won’t have cost you any money. 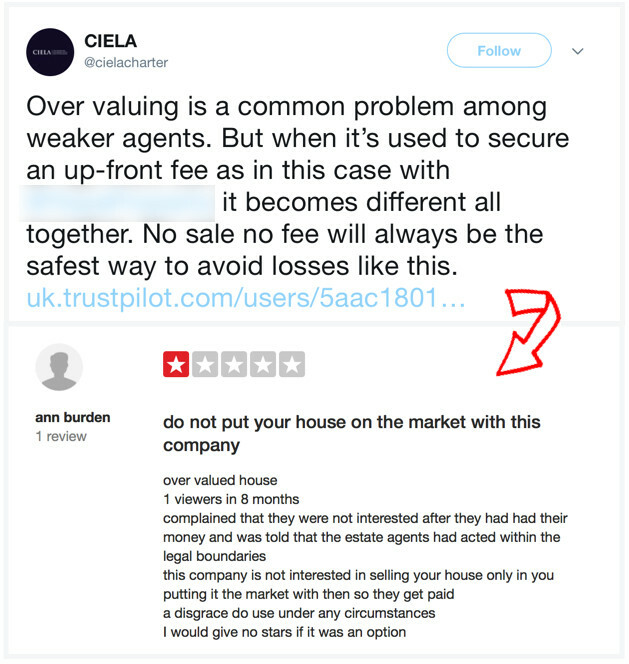 The now defunct trade group CIELA highlight how easy it is for ‘pay upfront’ estate agents to use deliberate overpricing / overvaluing to extract a fee out of naive house sellers. With ‘no sale no fee’ estate agents, you’re still at risk of deliberate overpricing but you don’t hand over any cash at least. I’m contacted daily by people who have paid upfront but are now failing to sell. What’s obvious is how reluctant they now are to change agent (even if that’s exactly what they need to do) to stand a realistic chance of moving home within their required timeframe. Having already paid money to the online / hybrid agent, they don’t want to lose that money and then have to pay a high street estate agent’s commission on top. This attitude is totally understandable but it does prevent them from achieving their ultimate goal (of actually moving home). Selling a house does not always go according to plan (even the best laid plans). 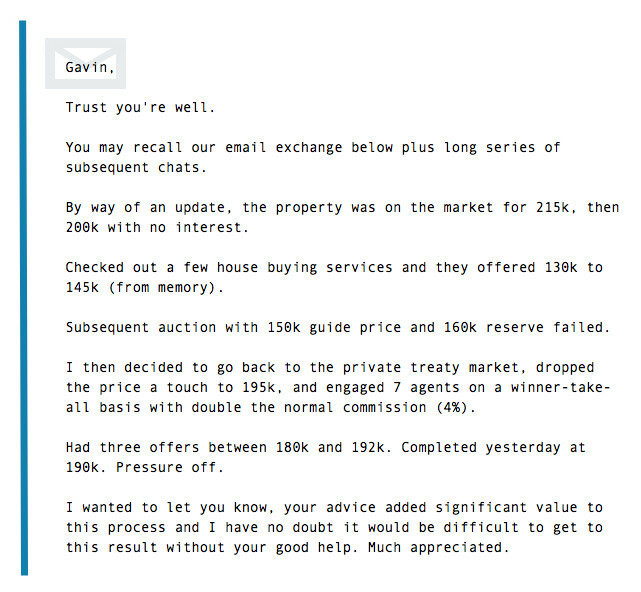 Even at the best of times, the odds of you having to change agent in order to reboot your sale are actually quite high. Only with no sale no fee estate agents do you maintain the ability to bring fresh blood into your sale without loosing money. At the moment, national ‘pay for failure’ estate agency services only have a tiny market share (around 5%). But, they have enormous venture capital backed marketing budgets and far more PR muscle / influence than small, local & unrepresented no sale no fee estate agents. 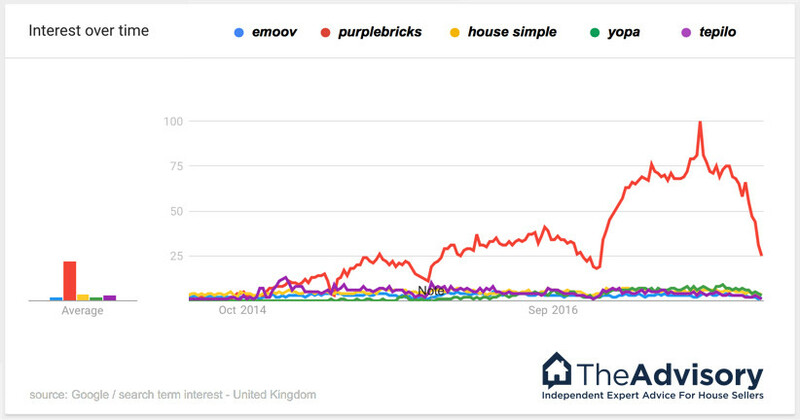 Interest in the sector is increasing mostly due to the £1m’s being spent by Purplebricks on primetime TV & radio advertising. Plus, given the high street estate agency industry’s negative reputation, these new services have had a easy time convincing much of the national press to label them as “the consumer champion, here to save the public from rip-off estate agents”. It’s potent stuff but is it also a ticking bomb? If these services grow to take significant market share. If these services maintain their 45%-50% ‘failure to sell’ rate. If house sellers remain reluctant to switch to a superior method of sale because they don’t want to loose the money they’ve already paid. …Then as they say in the USA, “Huston, we have a problem”. I realise there are a lot of ‘ifs’ in the above prophecy, so I’m at pains to point out that I am not saying it WILL happen, but I am definitely saying it COULD. Housing markets are most stable when transactions are healthy across the board. I believe ‘pay for failure’ estate agency services are a threat to the stability of the UK housing market. Like it or not, incrementally every house seller (through the estate agency services they choose to use) will play a part in what the future brings. Service = something that dependent on the level of skill with which it is executed, will impact on the price you achieve, the speed with which you achieve it and the stress you experience. Estate agents are right to be paranoid. Certainly, the majority of the house sellers I’ve spoken to over the years start out believing they are all the same. I have no doubt; mandatory publishing of fees will result in more instructions to the agents quoting the lowest fee rates. As such, estate agents tend not to publish fees so as to give themselves a chance to get a foot in the door – a chance to prove their worth and points of differentiation face to face (at a market appraisal appointment). I should point out, not all properties take the same amount of; time, work and money (spent on marketing) in order to achieve a sale. An estate agent won’t know what the job truly entails until they’ve seen the property and spoken at length to the vendor. Quoting their fees upfront is a recipe for demotivation because they would be quoting a price before they’ve accessed the job at hand. Can you imagine a builder quoting for a renovation project before they’ve inspecting the property? If the potential client is extremely unreasonable &/or unrealistic, the estate agent can politely deflect a potential “disaster instruction” by over-quoting their fee. Alternatively, if the opposite is true, the estate agent can reduce their fee if they feel it will improve their chances of securing a client that will be a pleasure to serve. It’s a populist issue that some consumer groups love to use (given its reliability in generating publicity for themselves) by calling for all estate agents to openly publish their fees. I am not sure these groups have thought it though or understand the unintended consequences of this. I am in no doubt that the public would be worse off if this came into force, as it would further encourage a focus on fees as opposed to a focus on the quality & suitability of an estate agent. Over and above earning a commission from selling your house, estate agents have a number of other potential revenue streams. I see nothing wrong with estate agents earning referral fees, as long as the service being recommended is being recommended based on quality of service (not size of referral fee). In fact, a service provider reliant on referrals from an estate agent will be under the thumb to a degree, which can result in extra support to you (and better service). It’s a matter good estate agents take seriously. Real damage can be done to an agent’s brand from them recommending services that do not provide satisfactory service levels. Not all estate agents are the same and some do base their recommendations on size of referral fee (not quality of service being offered). As such, this is one area where I would encourage you to shop around. Certainly worth doing if the recommendation is coming from either a corporate estate agency or a national online / hybrid estate agency. Given intense pressure from management & the target driven environment many estate agents work under, some can be extremely pushy, especially when it comes to seeing their ‘in-house’ mortgage advisor. You are under zero-obligation to use any of the services being offered by the estate agent. If you feel you being unduly pressurised (sense bullying or aggressive tactics being used) first complain to the office manager (follow the in-house complaints procedure) and if you are not satisfied, escalate your complaint to the Ombudsman scheme that agent is a member of. Consumer Protection Regulations (CPRs), The Estate Agents (Provision of Information) Regulations 1991 and The Property Ombudsman’s (TPO) code of conduct are reasonably clear on this. In addition, The Property Ombudsman’s Code states, “Any fee earned should be declared” [ref: Section 2.c – TPO code for residential estate agents England, Wales & Northern Ireland]. Estate agency fees can amount to a large sum of money. As such, the stereotype paints them as rolling in it. Certainly, a number of estate agency owners have created successful business and amassed serious wealth (see: John Hunt, Michael Bruce & others). In urban areas, it’s not unusual for junior negotiators to work 8:30am – 7pm Monday to Friday & 9am-5pm on Saturdays. Given so much depends on commission, it not usual for many estate agents to work out of hours (in order to accommodate the schedules of buyers & seller clients). Most estate agents are on low basics with an On Target Earning (OTE) commission bonus if targets are met. Given the sheer number of estate agents in the UK (all chasing dwindling numbers of instructions), it’s getting harder and harder for them to reach their targets. Don’t think for one minute they all earn the salary estimates I’ve listed below. And that’s on a 45h-60hr working week. How much commission does a negotiator get? Typically, the negotiator that manages to secure a sale will be entitled to 10% (rising to 35% for more senior staff in some London agencies) of the estate agency fee. On the sale of a £300,000 property the agency will earn £4,500. Of that, the negotiator will be entitled to 10% commission equaling £450 (10% x £4,500). This structure goes some way to explaining why bad / apathetic negotiators are not particularly interested in negotiating sales to their fullest. Lets look again at the £300,000 sale above where the negotiator takes home a personal commission of £450. Now, lets say, had they worked a bit harder / smarter, they could have negotiated an extra £5,000 out of the buyer. In this case, you would be £5,000 better off (a sizeable sum larger than the estate agencies entire 1.5% fee). However, for the negotiator at the coalface, they would only have earned an extra £75 (not a huge amount and not without it’s risk of alienating the buyer and loosing the deal / commission completely). For many agents, it’s a point of pride to get the best price. For others it is not. This is why, although we wholeheartedly back ‘no sale no fee’ estate agency, there is wisdom in you putting in place enhanced fee incentives (as detailed previously) to ensure your negotiator’s motivations are aligned with your financial well being. A number of years ago, there was a lovely piece of research made famous in a great book call Freakonomics. They also achieve upwards of a 3% higher sale price compared to what they sold their client’s homes for. What this research shows is that by default (and even when earning a fee) estate agents are not necessarily motivated to get you the best result. Given there is 3% (and upwards) of the sale price up for grabs, again I feel this is a compelling reason to consider putting in place enhanced fee incentives to make sure you leave nothing on the table when it comes to your sale. When interviewing estate agents, it’s worth asking which structure their agency runs because there are pros and cons to both. Within pooled commission structures; if a negotiator makes a sale, the commission goes into a central pot and is shared between all the negotiators working at the agency. Critics of this commission structure worry that the moment one negotiator has interest in your property, the other negotiators lay off, knowing they will get a percentage of the deal. I have not doubt this is true in many (but certainly not all) cases. Within Personal commission structures, only the negotiator that makes the sale earns the commission on offer. Pro: Staff members are highly motivated to generate competing offers from buyers. Con: Can cause infighting within the agency and with inexperienced team members (or weak management) this infighting can negatively effect seller clients. There is no right or wrong here but all things being equal, I’d take an agency operating ‘personal commission’ over ‘pooled commission’ given it’s inherent ability to enhance motivation. However, it’s not a ‘deal breaker’ for me if the most suitable estate agent for the property is operating pooled commission. This requires estate agents to give certain information to seller clients (information obligations). This includes an explanation of the terms used in the contract between the seller and the agent, in connection with the agent’s entitlement to remuneration and other payments. Particulars of the circumstances in which the client must pay remuneration to the agent for carrying out estate agency work (section 18(2)(a), EAA 1979). The amount of that remuneration (or the manner in which it will be calculated) (section 18(2)(b), EAA 1979). Particulars of any payments which ‘do not form part of the agent’s remuneration for carrying out estate agency work’ (other payments) and details of the circumstances in which the other payments will become payable (section 18(2)(c), EAA 1979). The amount of the other payments (or an estimate of the amount and the manner in which it will be calculated) (section 18(2)(d), EAA 1979). What does The Ombudsman say about fees? By law, all estate agents must belong to an approved redress scheme. Approximately 95% of all UK estate agents are members of the scheme run by The Property Ombudsman (TPO). The TPO has an approved code of conduct all member estate agents have to adhere to. By law the agent must give you written details of their Terms of Business including their fees and charges before you are committed or have any liability towards them. All fees and additional costs must be fully explained, clearly and unambiguously stated in writing before you are committed to the terms of the agent’s contract. Where the agent’s fee is a percentage it must be quoted (within the Terms of Business) inclusive of VAT and also expressed as a monetary amount. The example amount should be based on the asking price of your property and they must make it clear that, should the selling price be higher or lower then the asking price, the agent’s commission fee will be correspondingly higher or lower. As such, if your asking price is £100,000 and the agent is charging a 1% fee + VAT it should clearly state in the contract that the fee is 1.2% inclusive of VAT (£1,200.00). If the agent is charging a fixed fee, the agent should state the actual amount payable including VAT. The agent should also make it clear that the fee will not vary whatever the eventual sale price. Except for any previously agreed additional costs, commission fees will become due on exchange of contracts [editor note: In the vast majority of cases, you become liable at this point but only actually pay the fees upon legal completion of the transaction]. If and when you terminate your agent’s instruction, the agent must explain clearly in writing any continuing liability you may have to pay a commission fee and any circumstances in which you may otherwise have to pay more than one commission fee. I come across a lot of advice online written by organisations that have near zero house selling experience (but who are no doubt well meaning) that follows a fairly shortsighted line of thinking. An obsession with ‘shopping around’ to ‘get the best deal /cheapest fee’ seems to be the primary goal and message put forth. I would suggest this is wrong, or at least counterproductive. #2. Estate agents, like most people in employment, are ‘in it to make money’. Of course, it’s your house sale and your call…. Hopefully this just provides a little pause for thought. This is very thorough and helpful. Thank you. I am having a problem as a landlord with my estate agent on a let ( lack of information about per centages taken on subsequent years) —-I don’t suppose you have information on this? 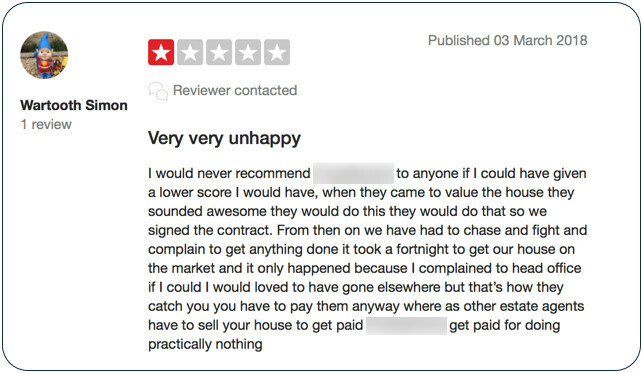 Hi Ginny – first you should complain directly and formally to the letting agent. Step one is to write to the branch manager of your lettings agent detailing your complaint. Send this recorded delivery (or deliver by hand) and keep a copy for your records. If you do not get satisfaction escalate your complaint to the mandatory redress scheme they’re members of (most likely The Property Ombudsman). You can also escalate your complaint to their trade body (if they are a member of one) – ARLA, NAEA, NALS, UKALA are the most well known. Or speak to your local Trading Standards office. If all else fails you can also think about taking them to small claims court. Estate agents: All you need to know!